He's making a list, checking it twice, going to find out who's naught or nice....Santa Claus is coming to town!!!! Are you all ready for the big guy to come down your chimneys? Hopefully everyone has been good and will get lots and lots of presents :). Christmas is now just 3 days away...can you believe it? It feels like this month and year have just flown by!!! These three days for me are going to be filled with cookie baking, nail painting, and just relaxing. I can't believe I'm coming close to the end of my Christmas manicures! Seriously, this is the second to last one before the big day! Well, that might be a lie. 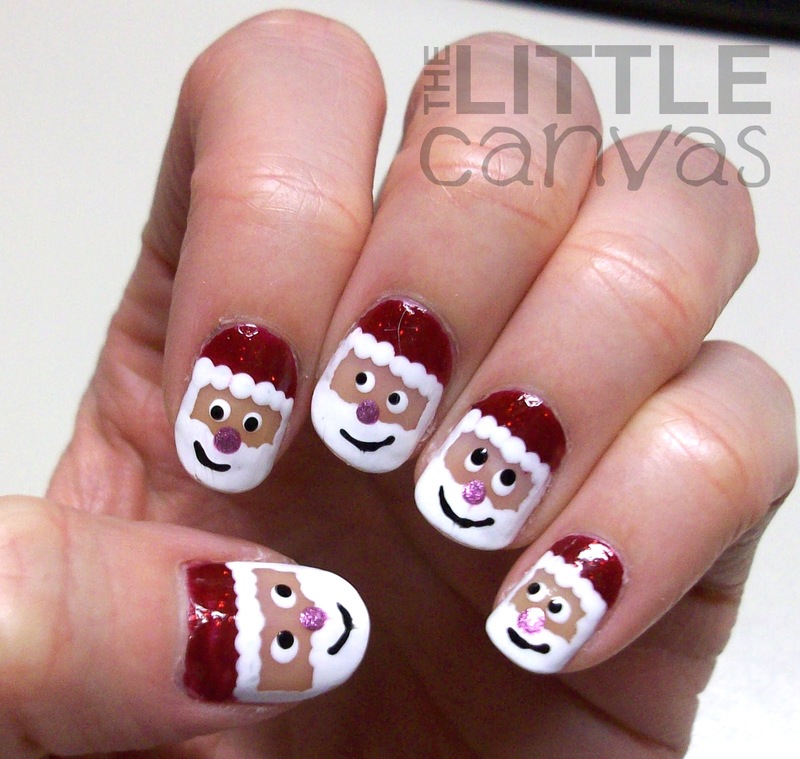 As I sit here typing this post up, I'm realizing that since my posts are at least one manicure a head of the posting, I may end up with no manicure for Christmas. This means I might be bringing you a Christmas Eve and Christmas Day post! For you new readers, I post to the blog every three days. This post goes up on the 22nd (obviously), then I'd have one for the 25th, 28th, and 31st. The manicure I'm painting for the 25th as it seems was painted on 12/19, and well lets face it, no manicure will last on me from the 19th to the 25th! So yup, you may be in for some extra posting!! Okay, enough of that rant, onto my nails! What does every little child think of when they think of Christmas? Yup, Santa Claus! I needed to have the jolly ol' fella on my nails! I have received so many compliments on them, and my two nephews were in love with them! This manicure I did last year, again when I was new to blogging. I'm going to start off by saying how much I love this years nails over last years! I'll let you be the judge! Please excuse my last photo with it's random colors. It's orangier than I would have liked, but it showed the thumb art the best! I think out of all my Christmas manicures, this one took the least amount of time. I started off with a base coat of NYC Matte Me Crazy Top Coat. Some of you may or may not know, but I use this matte top coat as a base because I believe it makes my manicures live longer. The polish also applies a lot smoother when that matte is the base! Call me crazy, but hey it works. When my base was dry, with a nail art brush, I took the gorgeous Red Carpet (a red almost jelly glitter polish) and drew on the hats. I then took the white polish and painted on side burns. I then let this dry for at least a good five minutes. 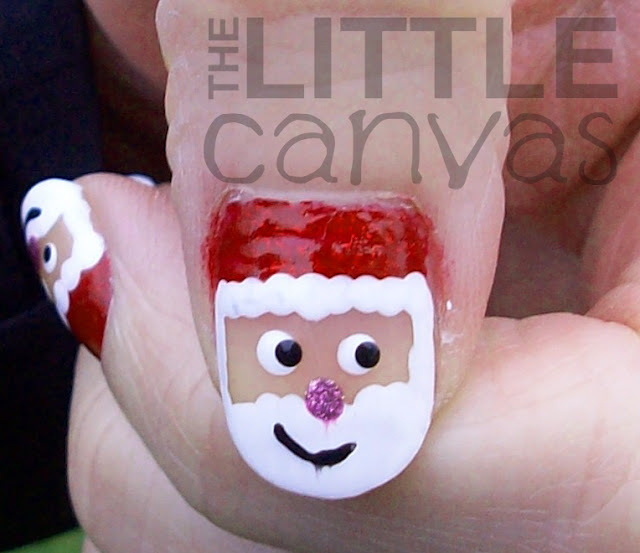 I wanted to ensure the red polish was completely dry before dotting on the fringe to Santa's hat. Every time that I have previously put white polish over red, the red leaches into the white turning it into a nice shade of pink. Luckily, that didn't happen this time around!!! With my dotting tool I dotted on the hat fringe and the beard. 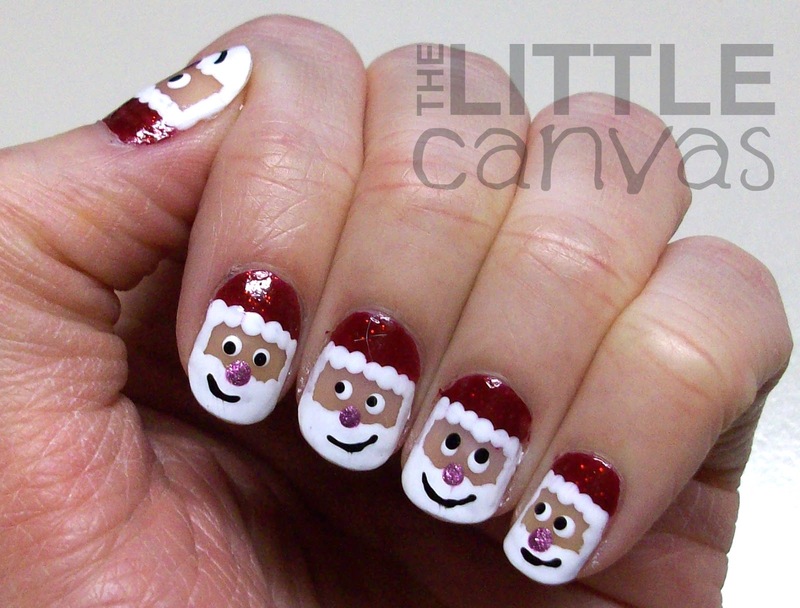 I then added the eyes, nose, and mouth, slapped on some Out the Door, and enjoyed my lil Santas. 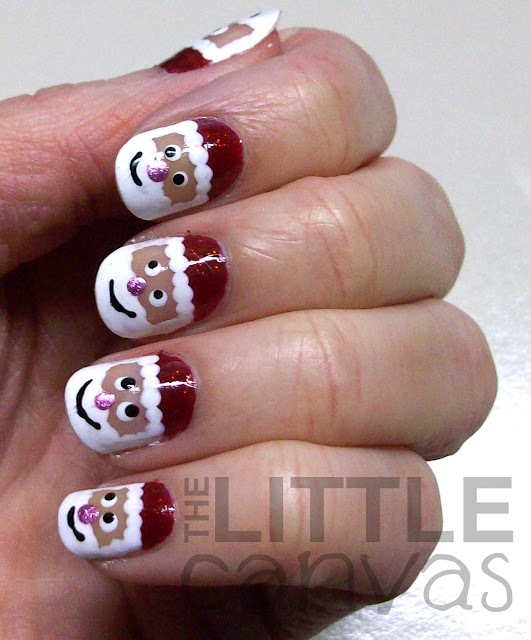 This is last years attempt at Santa Clause....almost embarrassed to post them! No clean up, short nails! ahhh. For someone who owned NO dotting tools and NO paint brushes, this was a very good attempt. You can see on the thumb I had some of red bleeding into the white like I mentioned earlier. I like my eyes on this years guys also. Since I have longer nails, I had more room to decorate, therefore, larger eyes. Same goes for the smile. I really think that made them! What do you think?? Last years Santa Claus or this years? hahaha maybe just a little! Super cute! I'm liking this years Santa's but how fun to see how you have progressed over just 1 year! 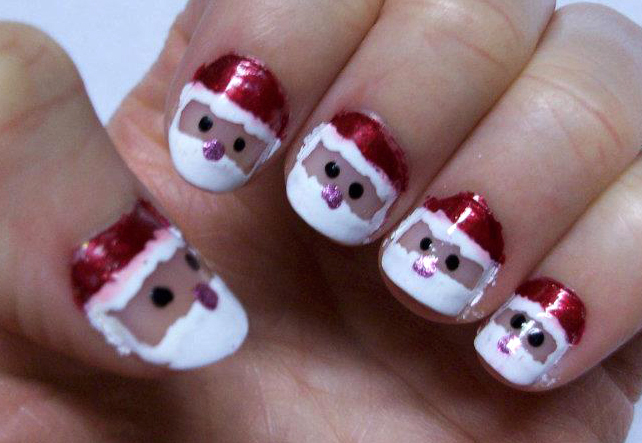 I love this nail art, very cute and pretty freaking awesome, your collection make trend for those who love to adopt every new design, amazing nail art, thanks for posting this santa nail art. This year for sure! ;) It's fun to look back at old manis and photos. Very cute! Thank you!!! And i'm def liking this years more also! I hope to do more comparisons now that my blog is almost a year old!